Like it or not, winter is here. With it came the cold weather running most of us deal with all season long and it can be a total de-motivator. Here are some great ways to conquer the cold, stay on track with training and head into spring ready to rock. Layer up. When it’s zero degrees out following the rule ‘dress like it’s 20 degrees warmer’ means extra clothes. Breathable, sweat wicking fabrics with vents are your best bet for staying warm without overheating. Don’t be afraid to try stocking under long tights or wool socks. Remember, you can always take a layer off if you get too warm. Gear up. Gloves, an ear warmer, shoes with as little mesh as possible and a dry change of clothes are all a must when prepping for cold weather running. Additional winter running tools include reflective vests and headlamps for the waning daylight and YakTrax for managing very snowy conditions. Warm up. When the weather’s nice, warming up outside is typical. When it’s cold, warm up indoors. A stretch and some burpees or jumping jacks gets everything moving before slipping out the door. The cold doesn’t feel so chilly after your blood is pumping and muscles are ready to work before going outside. If you’re not solo and are waiting for a group, stay in a warm building or toasty in your car instead of standing around letting your body get cold again. Watch the wind. There’s always a steady breeze here in Virginia Beach and winter winds can be brutal. Running into the wind is always tough but it can also cause sweat to freeze and your core temperature to drop a little bit more. Start your run into the breeze then you won’t have to deal with cold, damp clothes getting even colder on the second half of your run. Stay hydrated. Cold weather running might not feel as sweaty as when it’s hot but just because you don’t feel it doesn’t mean your body isn’t burning through fluids. Skip the ice cubes and put warm water on your route or carry it between layers to prevent freezing. Also check any water fountains on your route to make sure they’ve been left on once temperatures dip below freezing. Undress. ASAP! Swap out sweaty running clothes for dry ones you have handy. Wrap up in a big fluffy beach towel or washable blanket. Your core temperature drops quickly after cold weather running which can lead to chills that take a long time to shake. Get warm and dry as soon as possible by drinking a warm hot chocolate, putting a hat on wet hair and swapping out sweaty sports bras for something more comfy. And don’t forget, when cold weather running becomes unbearable, a run or two on the treadmill won’t be the end of your running career. What do you love about cold weather running? How do you prepare for a cold run? This entry was posted in Fitness, Running, Wellness and tagged running, training, winter running on January 25, 2016 by meredith@fitnicept.com. It’s winter. Training doesn’t stop just because it’s cold or snowy out and neither should you. Running in the cold is just fine as long as you’re prepared for it. With the scientifically perfect running temperature somewhere between 50 and 55 degrees, running when it’s 25 outside can present a few challenges. Here are five tips to help you succeed with your cold weather training. Plan. Give yourself time to get moving indoors and figure out which way the wind is blowing. It won’t feel quite so chilly out there if your blood is pumping. You’ll also want to finish your run with the wind, rather than against it. This will prevent your sweaty body from getting blasted by cold air and help you finish strong. Layer up. You’ll figure out what works best for you as you gain experience but if temperatures are below freezing, layers should be at least two deep on the bottom and two or three thick on the top. I like to be warm. My below freezing gear includes stockings, long tights, wool socks, tank, thin layer and a fleece lined half zip. Make sure your outermost layer is bright and remember that you can always take something off should you become too warm. Protect your small parts. Even if there isn’t snow on the ground, you’ll want to protect your feet from the elements. Wear shoes with the least amount of mesh possible and try pairing them with wool socks. Keep hands and ears safe by always sporting earmuffs or a warmer and gloves or mittens. Running in the cold can look cool! Stay hydrated. Even if you’re not dripping sweat, running in the cold burns through fluids as your body works overtime to keep your core temperature and muscles warm enough to perform. Your body doesn’t send the same thirst signals to your brain in the cold, making a good hydration plan a key part of running in the cold. Expect to slow down. Your body works overtime trying to stay warm but muscle contractions just don’t happen with the same power as when it’s 50 degrees. There are a slew of other reasons running in the cold isn’t the same as on those perfect days, too. If there’s snow on the ground, expect to slow down even more as you pick your way through snow drifts and potential icy areas. Use these tips for running in the cold to stay safe and warm this winter. This entry was posted in Fitness, Running, Wellness and tagged running, running in the cold, safety tips, tips, winter running on February 23, 2015 by meredith@fitnicept.com. Myth #1: Treadmills have to be set a 1% incline to simulate outdoor running. Nope! Outside you have to push through the air. On a stationary treadmill, that resistance isn’t there. That is what makes treadmill training runs slightly easier. To make up for this lack of air resistance you can increase your speed. And that might not even matter. This study shows that incline only matters at paces of 7:09/mile or faster, leaving most of us OK to run flat. But it’s still not the same! Myth #2: Your running motion is different on a moving belt. According to this study, and others, it’s actually not. It might feel different because of the treadmill’s springs but your muscles and joints move the same way during treadmill training as they would over pavement, trail or track. This ties into Myth #3: You take more (or fewer) steps on the treadmill per mile. As demonstrated with Myth #2, your motion on the treadmill is virtually identical to how you move over a stationary surface (road, track, field). This also means your step rate (cadence) is the same. Winter treadmill training runs can be a great time to figure out how many steps you take per minute at a given pace and can certainly benefit your future training. Myth #4: Holding on doesn’t affect your workout. Yes, it does. Holding on or pushing yourself up with your arms does not, in fact, decrease the stress on your lower half. The relief you might feel in your knees, ankles, quads and hamstrings will lead to tension in other places on your body. Undue stress leads to injuries. Slowing down and letting go on your next treadmill training run might just save your spring race season. And trying to use the metal sensors to figure out your heart rate? Forget it. Myth #5: The treadmill tells the truth. It does not. The readouts for calories burned, speed, heart rate and distance can all be wrong. Unless the machine is calibrated to your body on a regular basis, it’s going to be off. In the ballpark? Probably. Your best bet is use a heart rate monitor that straps to your chest or wrist to determine exertion levels and simply run (with no incline) for your desired amount of time. Now you’re ready to go! Stay healthy, improve fitness, increase speed and keep running all winter long with these treadmill training myths dispelled. This entry was posted in Fitness, Running and tagged indoor training, running, treadmill, treadmill running, winter running on January 12, 2015 by meredith@fitnicept.com. Winter isn’t over yet, and there’s probably more snow on the way. 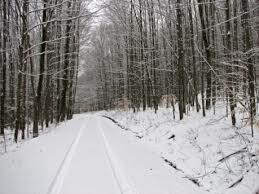 Good news or bad, the same way driving on slippery roads can be treacherous, running in snow can be dangerous, too. Anything more than an inch or two can put an unfortunate cramp in a training schedule with business closures, poor road conditions and unshoveled sidewalks. As we head towards March, many runners are deep into training routines for Spring races and a day or two off because of unsafe running environment is much less than ideal. Here are 7 tips from Team FitNice that will help keep you safe, warm and injury free when you want to, or have to, go running in snow. Slow down. You won’t want to run your usual pace in slippery conditions because it’s harder work. Much like running in sand, running in snow recruits muscles in your inner and outer thighs that don’t work very hard on solid ground. With them pulling overtime, you’ll feel fatigued sooner. Use trail shoes, spikes or Ice Grippers. Making sure your shoe has ample traction is incredibly important when running in snow. Good treads, spikes or ice grippers add traction to each footfall and mean you’re less likely to slip, slide or take a spill. Two pairs of socks. If you’re heading out in the snow, you’ve probably already faced the fact that your feet might get wet. Help keep them warm and dry with two pairs of sweat wicking socks. Make sure your shoes still fit with an extra pair, but don’t be afraid to loosen your laces. Change your stride. A shorter stride will help you balance, lowering the risk of slipping and falling. You can also improve balance by making sure your foot lands directly under your hips. This increases the surface area of your foot that touches down and better stability. Find fresh snow. At least snow that’s crunchy. Plowed, packed snow is much more difficult to navigate that fluffy stuff that helps you grip. Think with your eyes. You want to be seen, so dressed in brightly colored clothing and wear a safety vest or reflectors. You also want to avoid potholes and icy patches, so be sure to constantly scan your surroundings. Focus on effort. It’s hard to run adjust your stride and run in snow. Be sure to account for the extra work your muscles are doing when you choose how far or how long to run. Keep your running shoes close and your shovel closer as you prepare for your Spring Race Season. Use these tips to stay injury free regardless of weather conditions and remember to always put safety first. Did weather force you to change your schedule? Ask us to help you get back on track! This entry was posted in Running and tagged running in snow, running safety, running tips, winter running on February 10, 2014 by meredith@fitnicept.com.